The Centre, a popular Richmond wildlife reserve and visitor attraction, offers visitors the chance to explore beautiful wetlands and see wildfowl and other creatures close up. A series of reedbeds, lakes, marshes and pools are home to a stunning variety of water birds, and fascinating animals such as dragonflies, frogs, lizards, newts and water voles. Company director Rachel Andrew and her family are keen wildlife photographers. Rachel recalls many happy childhood visits to one of WWT's other centres in Washington, Tyne and Wear. She chose to join the Trust after enjoying a day out at London Wetland Centre earlier this year. London Wetland Centre thanked Rachel with a special early visit to the reserve on Monday 23 August before it opened to the public. This was followed by a personal tour of the beautiful Wildside area of the site with Adam Salmon, the Centre's reserve manager, where the family were lucky enough to spot green sandpipers and hear Cetti's warblers singing. 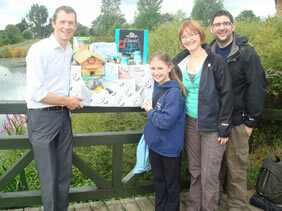 General manager Martin Senior presented Rachel and her family with a special hamper of WWT goodies . London Wetland Centre is part of a national network of wetland centres maintained by WWT, the leading UK charity for wildfowl and their wetland habitats. The trust was founded by the naturalist Sir Peter Scott. In addition to managing nine UK wetland reserves, WWT works across the globe to help species on the brink of extinction, such as the Madagascar pochard. Earlier this month WWT prepared 21 young cranes for release into the wild as part of the Great Crane Project, a scheme to re-introduce these iconic birds to the UK. "We became members of the WWT in order to support the work that they do and to be able to enjoy the centre throughout the year, as it is a fantastic location for wildlife photography. We really enjoyed our day at the centre where we discovered how much work goes on behind the scenes to make the London Wetland Centre such a special place for birds, animals and plants - and for the visitors like us who come to enjoy seeing them." London Wetland Centre General Manager presenting a special WWT hamper to 200,000th WWT member Rachel Andrew and her family. Image by Paula Pearce "We are delighted that Rachel chose to join WWT here at London Wetland Centre. Our members are really important because they ensure we can carry on protecting wetland wildlife. Rachel and her family will now be able to come in as often as they want and see how the reserve changes throughout the year."